ellehermansen: Tired of Feeling Tired? WakeMate to the Rescue! I really hope this thing lives up to its name. Like the Sleep Cycle iPhone app I wrote about some days ago, WakeMate is a cell phone app/accessory (although for all phones) that allows you to get the most refreshing sleep possible. 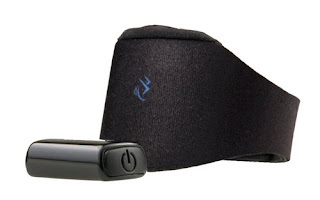 It tracks your sleep to wake you at the optimal time and tell you how to improve your sleep quality. 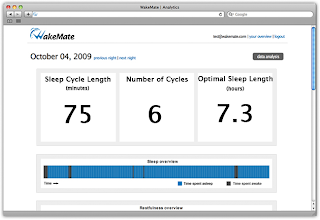 There is the WakeMate application for your phone, which you set to your desired wake-up time. Then you slide the wristband on and go to sleep! They even created an analytics platform so you can see your sleep patterns the wristband has generated from reading your pulse. This sounds a lot more promising than the Sleep Cycle app. With the WakeMate, you basically select a 20 minute window that you would like to wake up within. The WakeMate will identify an optimal point for you to wake within that window. An optimal point occurs about once every 20 minutes and waking at one of them will leave you feeling as alert and energized as possible. They say that after every night of sleep, they upload your information to their servers - and once analyzed, after a few nights of rest, they will be able to tell you optimal sleeping times to improve your sleeping patterns! You should consider pre-ordering yours today! Check out the site for more info!